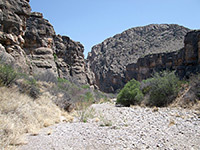 The northernmost trails in Big Bend National Park lead to a pair of narrow ravines in the Santiago Mountains, the long, thin range that forms a natural boundary between the park and the adjacent Black Gap WMA. The shorter of the two is the level, 2 mile path to Dog Canyon, a deep but relatively wide ravine leading right through the mountains to the desert at the far side, and bordered by steep, rocky hillsides interspersed with vertical cliffs. Rather more interesting is the 3.5 mile trail to Devil's Den in the mountain foothills a little way south; the Den is a narrow, enclosed, sheer-walled ravine through whitish limestone strata, containing pour-offs, potholes and terraces - like a slot canyon though not quite as narrow. 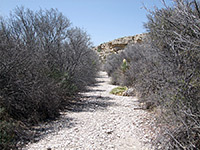 The rougher and less-used path to Devil's Den branches off the Dog Canyon Trail after 1.5 miles, and both ravines can be seen via an 8 mile loop hike of which the last mile is a cross-country walk back to the trailhead, a signed parking area along US 385. 16 views of Dog Canyon and Devil's Den; gallery, slideshow. The Dog Canyon hike begins at a pullout beside the highway, 3.5 miles south of the park entrance at Persimmon Gap. The canyon is clearly visible to the east as a distinct cleft in the Santiago Mountains, separated by a dead flat desert plain on which grows a sparse mixture of bushes, grasses, yucca and cacti including cholla, opuntia, Texas rainbow cactus and the Turk's head cactus. The shadeless walk across is not particularly interesting, and the surroundings do not change much until after 1.4 miles, where the path drops down into the wide, stony dry wash (Nine Point Draw) that leads to the canyon after a few more minute's walking. The gorge is quite short, less than half a mile, since it cuts through a narrow part of the mountains, and after a few wide bends it emerges into a similarly barren desert landscape on the far side of the hills, where the hike ends. The limestone rocks in the canyon walls are faded grey-brown in color, old, dusty and weathered in appearance, and distorted in alignment, with some strata in a fault zone upturned by 90°. At the narrowest point the gorge is still 100 feet across, and in all places the pebbly streambed is bordered by sandbanks and clumps of vegetation. 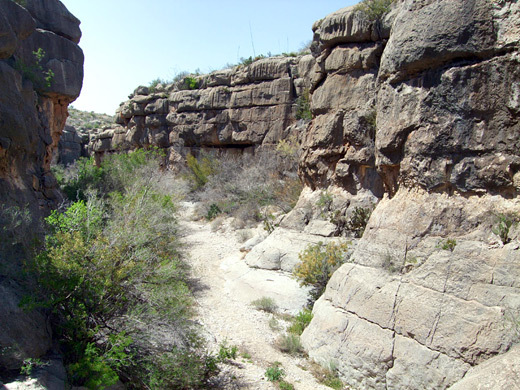 The cairned route to Devil's Den starts off upstream (west) from the point where the Dog Canyon Trail meets the dry wash, and soon forks south, up a tributary drainage, following this for nearly 2 miles as it curves around a range of undulating hills then turns southeast, towards the mountains. The wash is quite narrow and overgrown but walking is still easy, along the floor of coarse sand and pebbles. The drainage becomes temporarily much wider and starts to gain elevation more noticeably, as low cliffs rise up at either side. The zig-zag outline of Devil's Den is visible from some distance away, cutting through an otherwise flat, inclined plateau, and the narrows are reached after a slightly more strenuous hike further up the wash, past a few dryfalls and rocky areas. The limestone walls then become vertical, about 30 feet apart and 60 feet high, enclosing the streambed which is mostly bare rock, with pools, dryfalls, boulders and a few bushes growing at the edges. 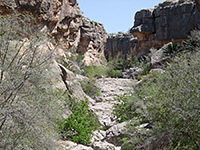 Vegetation is generally greener than in Dog Canyon since more water is retained, and the canyon is more sheltered. There is no marked trail through the narrows, and plenty of obstacles to overcome; some people prefer to walk along the southern rim and explore the canyon in the downstream direction. The upper end of the ravine opens out quite abruptly to the northern part of Dagger Flat, a wide yucca-filled valley whose southern edge is accessed by a 7 mile gravel track.